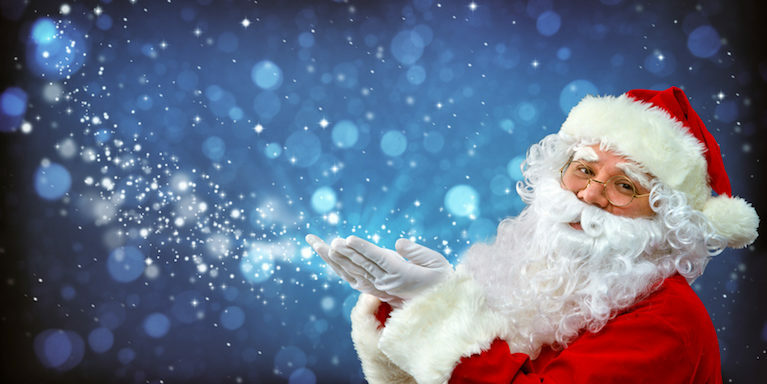 Santa Claus is Coming to Town… But which? Have your best Christmas ever with an online loan from Loans 2 Go! Yes it’s fast approaching that time of year! As those timeless lyrics from Frank Sinatra remind us, Santa is on his way. For those of us with children, seeing Santa during the festive season is a must. But how can we make sure that we find the best place to catch him? Since it opened in 2007, Hyde Park’s Winter Wonderland has become one of the most popular and well-established Christmas events in London. The icing on its cake is Santa Land, which is a magical Christmas experience for children. They will be able to see Santa’s Toy Factory fun house where Santa and his elves are making gifts ready for the big day and visit Santa in his Christmas grotto. Other attractions include a brand new 45m long Ice Slide, an Ice Trike Trail, The Snowman Experience and a Teletubbies Christmas show. Not to be outdone, London Zoo is also offering some wonderful Christmas festivities this year. They have created a magical after-dark experience for your family to enjoy once all the animals have been safely tucked up in bed. The zoo’s historic site and iconic buildings will be highlighted by a one-mile illuminated trail where fairytale meets fantasy, and larger-than-life illuminated wild animal sculptures rise high into the night sky. You will enjoy seeing fairy-light-spangled models of wild animals, glowing fountains and singing trees – and of course Santa and his trusty elves. The Eden Project’s Santa experience is wonderfully creative and imaginative. Your children will be able to experience behind the scenes action of how Santa and his elves are preparing for Christmas. They will see the elves’ bunk beds, pigeon holes full of children’s letters, and all the stockings laid out ready for the big day. They will then be able to settle down for a story beside an open fire, then enjoy a special moment with Santa himself. The whole family can also enjoy the Eden Project’s festive environment, including shimmering trees and an ice rink. Waterfront Winterland is Swansea’s must-visit exciting Christmas attraction. Situated in Museum Park – in the grounds of the National Waterfront Museum – it’s the ideal place for you and your family to enjoy a fun festive atmosphere. The experience includes ice skating, a funfair, festive food and most importantly Santa’s grotto. Thursford is a magical setting in which to meet Santa this Christmas. You and your family will take part in a fantasy journey and will meet penguins and polar bears, giant teddy bears ready to load Santa’s sleigh, busy elves hard at work in the toy factory and the snowman family. You will then make your way through the magical forest to reach Santa’s House where your children will meet Santa and receive a gift. There is also a full relaxed day on November 25th for children with additional needs. On this day the music will be turned down, the lights will be dimmed and there will be less queueing time. Definitely something for everyone this Christmas. For those that love the iconic Christmas movie The Polar Express there are Polar Express experiences this Christmas on the Mid-Norfolk Railway or the Seaton Tramway (Devon). These experiences really bring the movie to life: you are encouraged to wear pyjamas as in the movie as you climb aboard for your journey to the North Pole. During the journey you will be served by dancing chefs and waiters as scenes from the film are brought to life. Upon arrival at the North Pole Santa joins the train and makes his way through the train presenting children with their special gift. But if you want to have a Polar Express Experience this Christmas you do need to book quickly, as the Telford Polar Express Experience has already sold out. The Museum’s popular Santa Hunt weekends take place every weekend from 24th November to 24th December. You and your family can join the search for Santa throughout the fascinating Black Country Museum, and will be helped by festive costumed guides along the way. There will be clues to solve to find out the route, and the opportunity to sprinkle ‘magic dust’ on reindeer shoes and post a letter up the chimney to Santa’s workshop. When you do find Santa he will have received and read your letter, and will be ready and waiting with a surprise gift. Never mind the X Factor – for the real deal visit The Chill Factore in Manchester! This will guarantee you a white Christmas? The Chill Factore has twinkly lights, real snow and a magical grotto where your children can visit Santa himself. Fun for all the family with downhill doughnuts, luges and sledges. Definitely a cool place to go! Kielder Winter Wonderland is a full day experience packed full of festive activities for all the family. This wonderful day – based in a magical enchanted forest – features a range of activities including helping Mrs Christmas get ready for Christmas, helping in the elves workshop and walking through the forest to find Santa. There is also a Christmas theatre show, ice skating, snow tubing, and the opportunity to feed Santa’s reindeer. Children will be able to take home a Christmas keepsake from the elves workshop. This fantastic experience is based at North Ballochruin, Scotland’s top outdoor Woodland venue! The experience aims to capture the natural beauty of the woodland and bring it to life in a fun, interactive and memorable way. You will follow a tractor trail through the woodland in search of Santa’s woodland cabin. On arrival, you will be greeted and invited into the cabin by Santa himself, where he will be waiting to hear all about what you would like for Christmas. We hope that you do manage to track Santa down this Christmas! If you need any financial assistance over the festive season then an online loan from Loans 2 Go may be just what you’re looking for: click here for more information.